« Prince Albert National Park: Simultaneously disappointing and amazing! I’m fresh back from a trip to Saskatchewan – my ninth Canadian province – meaning that I have one to go, plus the three territories. My explicit goal is the complete the provinces, but I am not sure I will attempt the territories: while the Yukon and Northwest Territories are easy, Nunavut is shockingly expensive to get to – at least whenever I examine ticket prices. 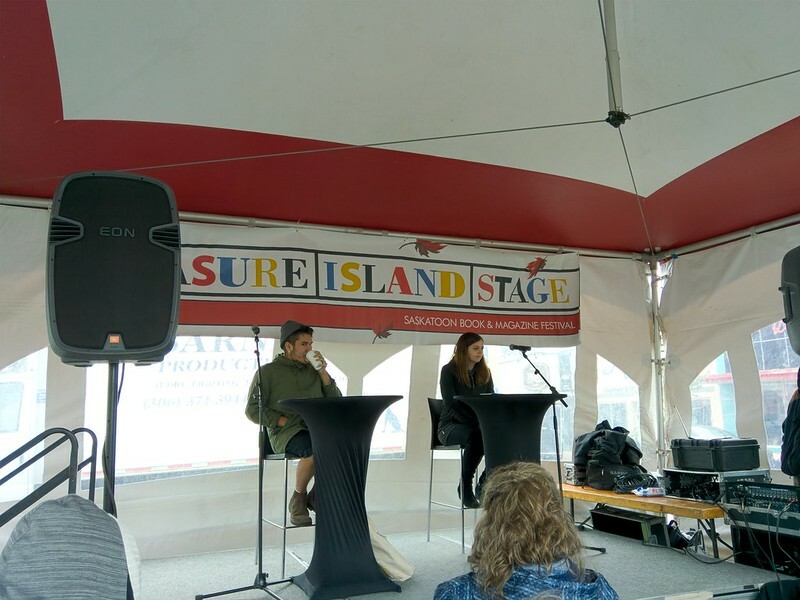 Billy-Ray Belcourt and Chelsea Coupal on the stage. If they look cold, it is because it was cold. Billy-Ray Belcourt – Sometime in the last year, Bill-Ray crossed my radar and I ordered up his poetry collection, which made its way to me in Berlin. It probably spent two months on my physical-paper objects to read pile before I realized that Billy-Ray would be speaking at the Saskatoon Word on the Street literary festival while I was going to be in Saskatoon. I pulled the book of poetry out of the stack and started reading. Poetry is something that I typically struggle with – but his work penetrated my consciousness and I found myself laughing and sympathizing. Sunday ended up being a rather cold and dank day: generally misty, it was not a day to be outside, especially carrying around books. As such, the crowd at the poetry reading was actually quite large considering: about 30 of us sat/stood under the shelter of a tent listening to Billy-Ray and Chelsea Coupal, a poet from rural Saskatchewan, read from their collections. It ended up being a lively reading with the crowd clearly enjoying both poets – although I was under the vague impression that Billy-Ray had a larger fan-base at the talk. Diefenbaker Canada Centre – Throughout Canadian history, there has been only one Prime Minister from Saskatchewan, John G. Diefenbaker, who served from 1957-1963. Given that I enjoy visiting Presidential Libraries in the US, I thought it might be fun to visit the Canadian equivalent. Shockingly, as I understand it, there is only one – so I have completed my quest to visit the “libraries” of Canadian Prime Ministers. 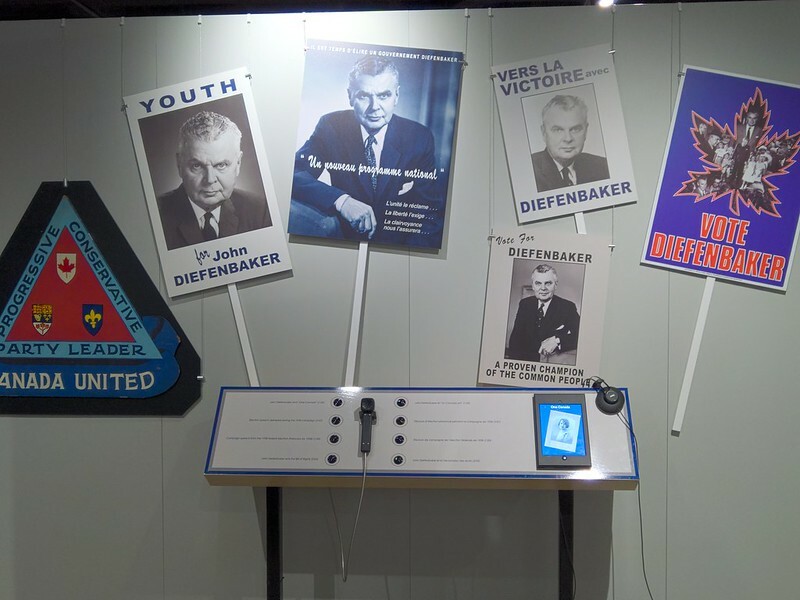 The exhibits far exceeded my expectations: it covered the life of Diefenbaker pretty thoroughly (as far as I can tell), talking about his hopes and aspirations for the country. I spent just under an hour there, which was more than enough to cover it all. Mi Casa – Saskatoon’s highest rated Mexican restaurant is actually a Mexican/Central American restaurant and was well worth the trip. I was the only customer who did not speak Spanish – which says something about the customers that the place attracts. The food was good and had nuanced flavors that were outstanding. I would highly recommend stopping by there. 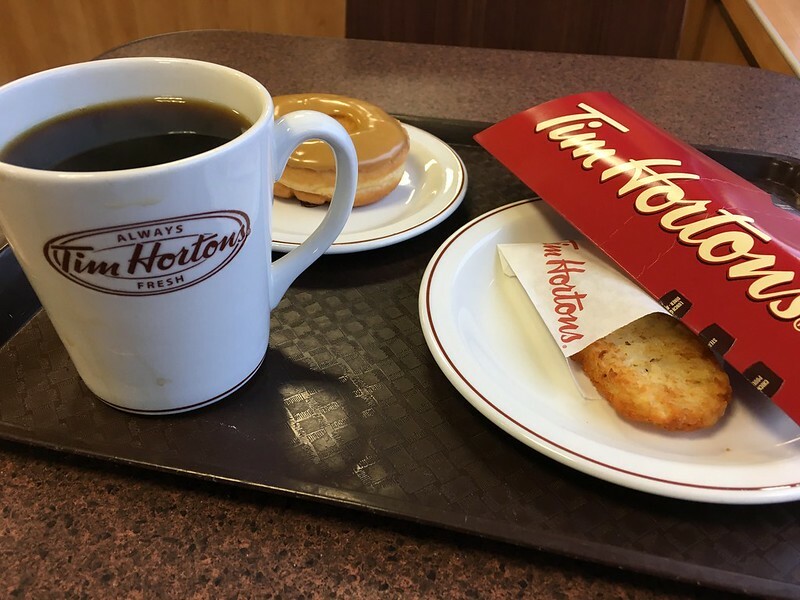 Tim Hortons – Face it: the coffee at Tim Hortons is not the best on the planet, but it’s fine. The donuts and breakfast items are great. The service is fast. I ended up stopping by Tim Hortons twice while in Saskatoon because it is a known quantity and it’s a great third space. Maple Leaf Lounge – Talk about lucky, Air Canada opened its newest MLL at the Saskatoon Airport on Friday, September 14: a few days after I got here, but a few days before I departed. The MLL is not huge, but its staff is incredibly friendly and the space is suitably dignified. 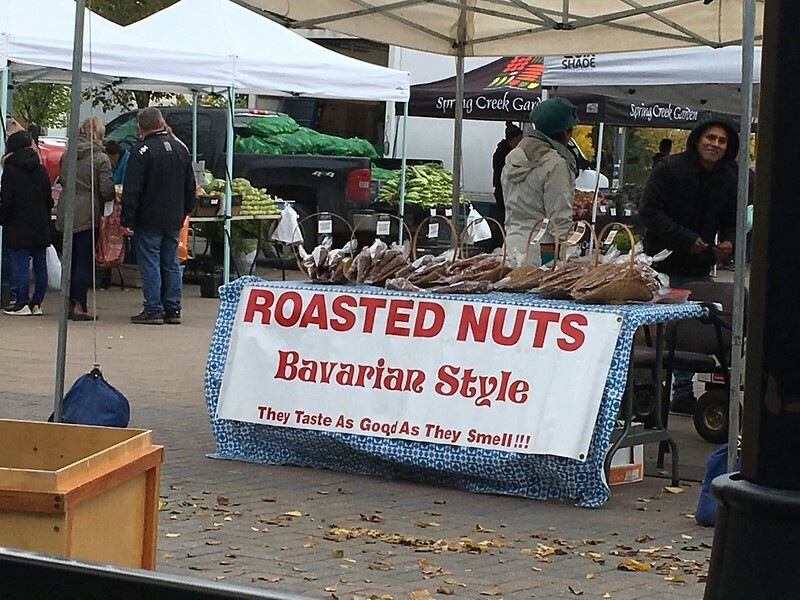 Saskatoon’s Farmers’ Market – I’ll say that the Farmer’s Market met expectations. If I had a kitchen and/or was staying in Saskatoon longer, I would have enjoyed it a whole lot more. Considering my traveling circumstances, it was worth a gander, but while the pies looked good, they were not going to go into my suitcase heading home. So… now that you’ve read about the things that met or exceeded expectations, the rest ranges from mildly disappointing to so completely disappointing that I wanted my money back. 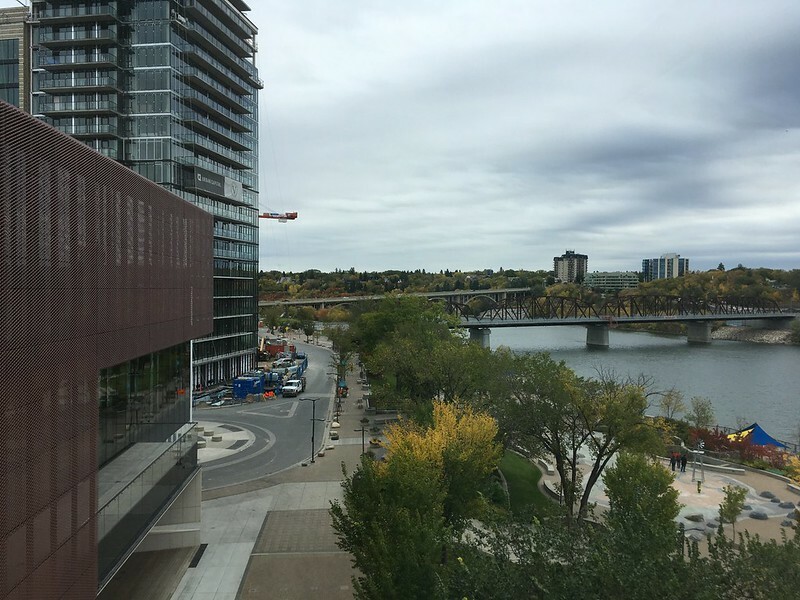 Remai Modern Museum – this is supposedly a gem of an art museum, but I found it lacking in multiple ways. Architecturally speaking, the architect was not kept in control: the building has extremely high ceilings (which I suppose might be necessary in parts of a modern art museum) – attempting to give a grand impression. I guess it worked, I felt like it was a grand space. One very strange choice were the doors into each gallery, which were glass, tall, and had a VERY LOUD CLANK every single time somebody opened it. I suppose it’s a way to wake up the bored security guards, but in an otherwise relatively quiet space, it scared the crap out of me each time. With respect to its art, unfortunately for me, there’d been a power outage the night before and two of the exhibits weren’t working. No discount on the price, just a vague apology. After spending an hour wandering around, I think I can say that their current exhibitions did not speak to me – and, in what I think is a very strange choice, they had a display of work by Picasso. Apparently, they have a large collection of Picasso prints (I forget the details). Given that I don’t particularly care for Picasso’s work, I can safely say the gallery was wasted on me. Ukrainian Museum of Canada – This was a huge disappointment: Saturday, it was closed for their annual meeting (I’d some how missed that detail on their website, so perhaps my fault that I didn’t notice) and it is only open on Sundays in the Summer. September is not summer. Thus, I did not get to see the museum. Pizza Pirates – the cold, wet, blustery weather deterred me from going outside Saturday evening. Further, I suspected that I was coming down with a cold (thankfully a wrong impression), so I found the highest rated pizza delivery restaurant, clicked onto their website and was stopped cold: they were not open! Naturally, I thought this was odd: it was 7:30pm on a Friday night. Surely a pizza restaurant would be open. Double-checking their website, they were open – so why was my online order not going through? I realized it was because my computer is set to Berlin time and at 3:30am on a Sunday morning, they would be closed. So, I adjusted my computer clock and my order went through. The resulting pizza, the Veggie Pirate, was interesting. The toppings were Ginger. Coriander, Mushrooms, Green Peppers, Hot Peppers & Onions; ultimately a decent combination. Unfortunately, the crust was too much: too bready, too much there. I should have ordered the thin crust version. The pizza completed its main purpose in life, which was to ensure I ate something at some point Saturday evening. Beyond that I would keep trying pizzas in Saskatoon – as a college town, it ought to have good pizza somewhere. Bon Temps Café – I kind of blame myself for thinking there might be a substantially OK Cajun restaurant in Saskatoon. I was wrong. There is not a substantially OK Cajun restaurant in Saskatoon. There’s a place that serves what it thinks is Cajun food but is actually far away from anything served in New Orleans. 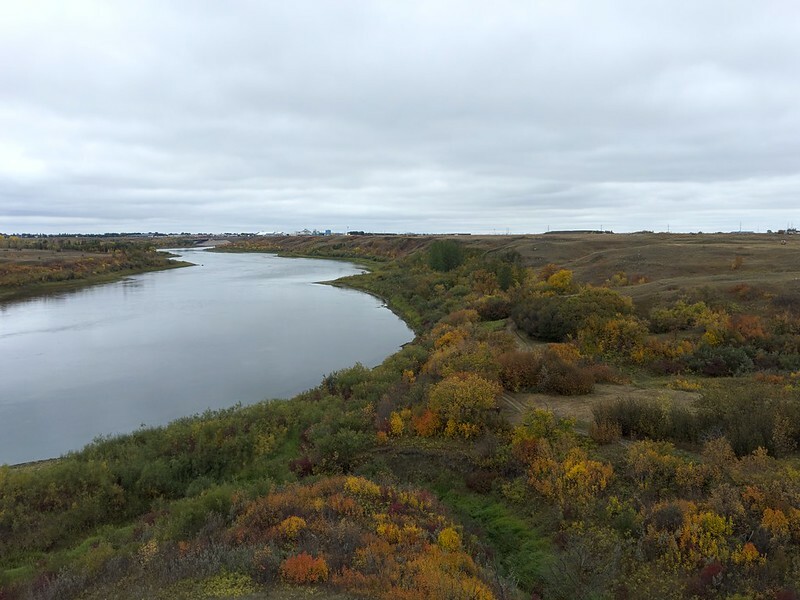 Wanuskewin Heritage Park: the website and reviews for this Native American center looked outstanding and I was super excited at the prospect of visiting it. To call this thing a dud would be unfair to unexploded ordinance everywhere. After paying $8.50 to get in, I got to watch a 15-minute film that was, at best, uninformative. At worst, it was one of those films that asks a lot of questions but does not provide answers, a pseudo Socratic-style of introductory film. I then went into the gallery, which featured works by two artists – there were, at most, a dozen artistic objects scattered about the room – one of which was clever, the rest forgettable. The $8.50 also provided access to a network of trails around the substantial grounds of the museum. If one wanted, one could spend a couple hours wandering around the grounds, but it was cold and blustery, so I limited the trails that I walked. I kind of wanted my admission fee back. The last time I had that feeling was when I visited the Superman Museum in Metropolis, Illinois, about a decade ago. Ayden seems to have a pretty good reputation — which is what drove me to try it on Friday evening. Clearly, while the restaurant aspires to be something outstanding, it isn’t and it doesn’t have a clue on how to get there. On the food front, the flavors are creative, but not necessarily good. The Poke was adequate — nothing special, while the Beef Belly was not really memorable. For some reason, I foolishly decided to order dessert, the “Chocolate” — which managed to not be what I thought it would be. Service wise, the place is a disaster: each member of the wait staff oversees too many tables, resulting in service that is, at best, inattentive and unaware. I have no complaints about my waitress – she was working hard, but was covering at least five tables, probably more. When I pointed out that they’d overcharged me for dessert, it was taken off the bill — so on that front they were apologetic and responsive, but I had the sense that the restaurant has too many things going on and that attention to detail, which is critical at fine dining restaurants, is severely lacking because there are too many details to be tracked. I admire your stamina and determination to visit even the least-popular outposts of that vast land. You did well in finding stuff to admire. What about PANP, or is that in a separate post? Loved the remark about unexploded munitions.